Virgo Love Horoscope for 2016 forecasts that this year Virgo zodiac sign people will have the liberty to guide their love and social lives as per their choice. Social life will be in the back ground this year. You will be more involved in nurturing your present relationships rather than forging new love partnerships during the year. The 2016 Virgo astrology forecasts suggest that Virgos are looking for more liberty without obligations. The result will be that there will not be any change in the present status of relationships. Singles will prolong their bachelorhood. There is a remote possibility of marriage for those born in the last decanate of Virgo. Single Virgins are likely to find their soul mates in people linked to fields catering to health and well being. They may be found among doctors, nurses or in hospital environment. Romance at your workplace is also possible. These new relationships may not culminate in marriages in 2016. Zodiac compatibility in 2016 is dictated by the basic Virgo love traits. You will treat love as a chaste thing which should be used to serve human beings. You expect the same attitude from your lover in return. During the months of February and March 2016, you will be bolder and self-assured and will try to force your views on your partner. It will be prudent to cut down your expectations and be generous to your partner for the sake of harmony in your relationship. This is the only way to go about it for a happy and successful relationship. The 2016 love predictions suggest that if you are a married Virgo you will dictate terms in the family and you can expect significant changes in the family. Parents will exercise their pressure in the running of the family. You may be more devoted to your spouse or you may stray into new pastures in 2016. Single Virgos may think of getting into marriage during these months. People in relationships will promote their partnership to the next level in the month of March 2016. This may test marital relationships from July to October 2016. If you are looking for a second marriage, chances are that you will not only find new relationship but also will get married. The new partner will be fun loving, conventional, steady and older. Your soul mate will be more domineering but will guide your married life. 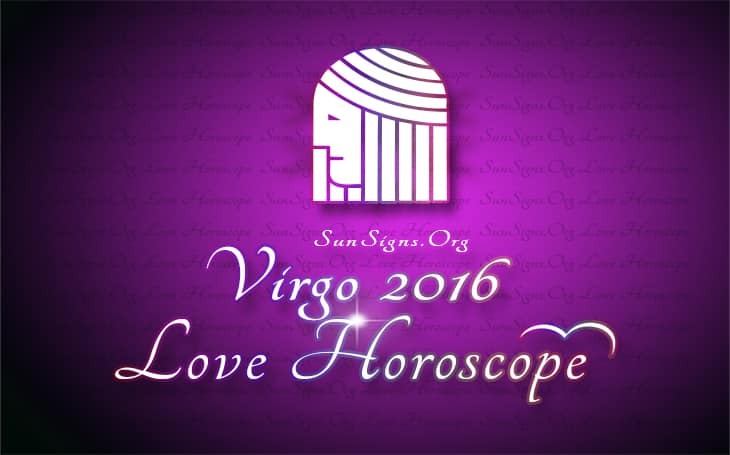 In the first half of January 2016, Virgo in love will be romantic and sexually passionate. Children and pregnancy concerns will dominate during the second half of the month. There will be conflicts with your love partner during this period due to Mercury retrograde 2016. The month of August 2016 will bring more lucidity to your relationships. There will be more sexual fun in your love affairs during the month of October. The 2016 astrology forecasts also suggest that your autocratic behavior may create disharmony in your relations from April to September 2016 and the environment may be vitiated. You should be more careful as your attitude may rock your marriage compatibility. Love will be blissful during the month of May. During July you should be more practical in matters of love and should not be swayed by emotions. During the months of November and December 2016, you will be highly generous and involve yourself in charitable activities. The Virgo 2016 love horoscope suggests that the month of December should be used to thank the Supreme Power for all the blessings in your love life. 2016 offers you a glittering romantic life. Keep a look out for love 2017 horoscope for Virgo.